Quite a bit of credit card debt in the United States is probably from people who didn’t have a good “money” plan in place. Lots of “emergencies” that really aren’t emergencies are charged to credit cards. Of course, that’s my opinion, but when you plan ahead, you really can save your sanity and save some money (no finance charges)! It’s stressful having to come up with a big chunk of money all at once. This where the idea of sinking funds comes into play. Sinking funds will help you plan ahead for “unexpected” expenses! Disclosure: This post may contain affiliate links to Amazon and/or Etsy, which means that I may earn a small commission from some of the links in this post. Please see our Disclosure Page for more information. The basic concept of a sinking fund is that you save up money, over time, for something in particular. It can be an annual bill, a vacation, a gift, anything! It’s more specific than just having a general “savings” account. Sinking funds are a great way to plan ahead and avoid surprises in your budget! How Does A Sinking Fund Work? Dave Ramsey always likes to give the example of Christmas. You know Christmas comes. every. year, you know when it’s coming. Yet, come November people are panicked about Christmas. Like they just realized it’s next month and how will they pay for presents. Christmas isn’t a surprise or an emergency. It’s something you can plan head for. In January or whenever, start setting aside some money for Christmas (like the old-fashioned Christmas Clubs). A little bit saved ahead is better than nothing saved so don’t let the fact that you feel you need to save $100 a month stop you from saving $10 a month! Here’s another example…Let’s say you have property taxes for the house approaching in 6 months. You can start a sinking fund by finding out the total amount of money you need and dividing that by 6 months. Each month you put a certain amount of money into the sinking fund. The idea is that when the time comes to pay your property taxes, you have all of the cash you need in hand to pay for it. Or maybe the tires on your car are old and you know that down the road you’re going to have to replace them. Start a sinking fund for them! Perhaps your kids go to summer camp every year – start a sinking fund for that. The more time you give yourself to save for something, the easier it is on your budget. So plan ahead as much as you can! An Emergency Fund (if you follow Dave Ramsey) is money in a savings account for the unknown, unexpected things that happen in life. True emergencies! He recommends $1000. 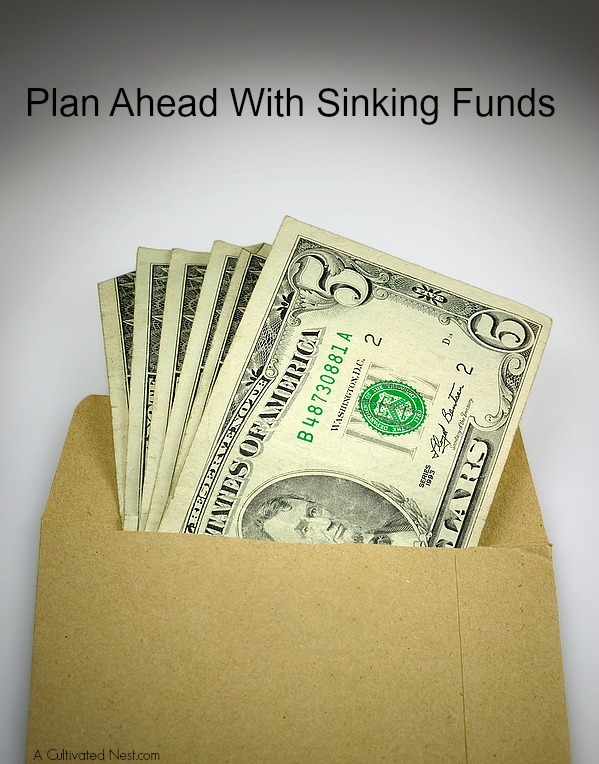 A sinking fund is for things you know are going to happen so you plan ahead and set aside the money. Cars are going to need repair! They are going to need tune-ups, inspections, oil changes and eventually new tires. These are all things that you can save for a little at a time. Putting a sinking fun together for your own kids’ birthdays and their friends is a way to feel on top of your situation when a birthday gift needs to be purchased. Kids always need clothing, there’s no doubt about that. Putting a sinking fun in place for kids clothing is one way to ensure your kids always have clothing and you never go broke. Of course, spending that money wisely is one way to continue to save money, even after you have the cash. Taxes of any sort can sneak up on you without any warning. If you’re self- employed, putting money back each week for taxes is one way to avoid a surprise when tax time hits. Although the majority of Americans own their homes, not everyone can afford the repairs that go into keeping their homes up to date. A home repair sinking fund is a smart move for any home owner. Eventually you will need a new roof and appliances don’t last forever (these days). You can use the envelope system of budgeting if you’re comfortable with having cash in your home. In which case you would have a envelope for gifts, car repair, home repair etc and when you get paid you would take out the appropriate amount of money in cash to fund the envelopes. So if you’ve determined that you want $100 in your budget to go to gift giving, you would put a little money in your gift envelope each time. Putting this money away each week is a smart move for those who want to plan for how they will use their money. There are some banks and credit unions that will let you set up as many savings accounts as you want at no extra charge (we use Capital One 360 formerly ING). Or you can just use one saving account but in your written budget divide that money into categories. This is a web based financial software. You have to pay to use this online digital envelope system. But it’s great for people that feel uncomfortable carry real envelopes with cash. Planning ahead can help you save money in so many ways. When you don’t plan ahead you are forced to use credit cards, which will only cost you more money over time. 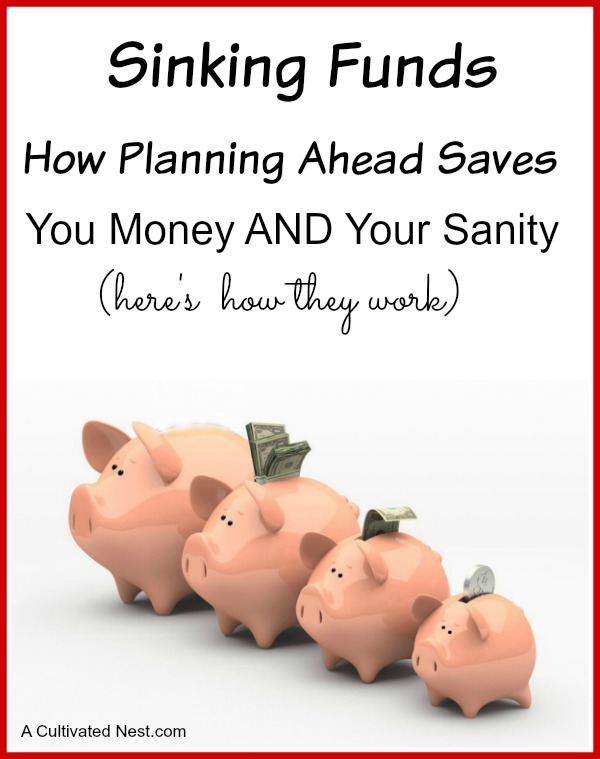 Sinking funds are a great way to plan and to save money! 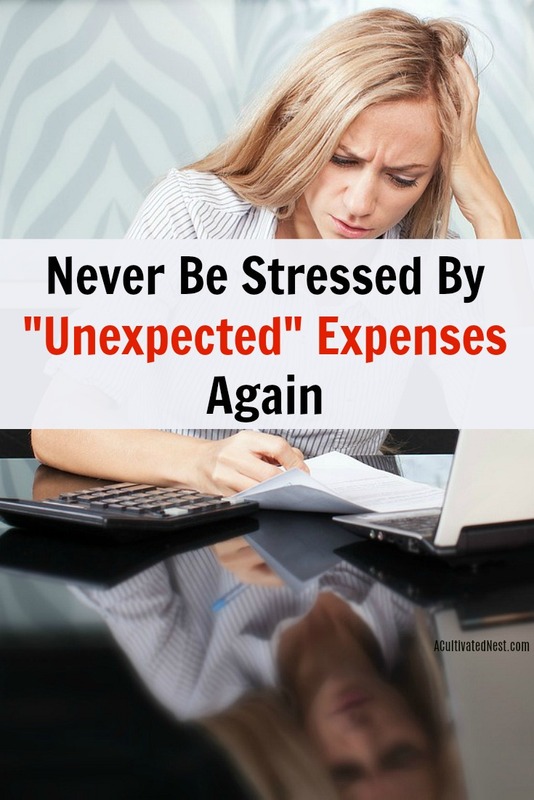 Not being prepared for expenses can break your budget! That’s why you need an Upcoming Expenses Tracker! It’ll make sure you’re always aware of what expenses are coming up soon! Do using sinking funds? What are some of your categories? my husband is the planet and has taught me everything. we have a savings account that holds our sinking funds in one place. we have a spread sheet that shows how much is allocated to each fund…car fund,home repair,taxes,vacation,christmas. we have had the same amounts in each category for our whole marriage. it has taken me years to get how it works… but that’s cause I’m slow to realize that the key to s as ving is not spending what you don’t have. I cannot believe it took me so long to get that. pay off the problem was that Or lives were extremely hectic for about the first 14/15 years of our marriage. we were newly married, starting a family and caring for my ailing mother. We /I spent a lot of money on convenience foods from the frozen section rather than choking. We have our sinking funds for large expenditures in separate bank accounts but for smaller things I do the same as you and your husband. I have a main savings account and use a spreadsheet to allocate that money into different funds. I’m a pen and paper kind of person – so I do most things the old fashioned way. You are not alone. It’s taken me several years to realize that we shouldn’t spend what we don’t have. But as far as convenience foods go, I find it better to have a few in my freezer/pantry than to go out to eat or having pizza delivered. Much cheaper than take-out! It just all depends on where you are in life and what your budget looks like. Yes, I love sinking funds! I use them for all of the categories you mentioned as well as computers, saving for pet things, medical expenses, my husband’s annual parking pass, so many things! It really helps with my sanity throughout the year. I use this software called YNAB which is actually free to students (my husband is a student) and it makes it all so easy. It’s like a virtual envelope system. I love it! I’ve heard so many great things about YNAB. I tried it years ago but it just didn’t work for us at the time but I’m considering having another go at it. Dave Ramsey has a new budget system out now too. I think it’s called Every Dime or something like that. I like it! I would love to start sinking funds. Right now every extra penny is going to credit card debt but I love this idea! Hi Manuela, Smarty Pig is a great way to have multiple savings account and they even offer incentives. For example if you’re saving for Christmas and have a $1,000 goal, when you reach the goal you can choose to either withdraw the $1,000 or they might offer it to you as an Amazon gift card for $1,100! Just google Smarty Pig- it’s pretty ingenious! You’re the second person to mention Smarty Pig to me recently. I’ll have to check it out – the possibility of getting an extra incentive for reaching a goal is pretty tempting! I have a sinking fund, and hubby doesn’t know about it ;). I use it for Christmas gifts usually, but going forward I’m going to use it for our travels. This sounded a little sneaky when I first read it, but then I realized how sweet it is to surprise your spouse with a gift or a trip! I’d love to do this once we are debt free…how fun! Well sinking funds are really something you and your spouse should decide on together since it’s a part of the budgeting process. But setting money aside for a nice surprise would be a lovely idea! We also use Smarty Pig and have for the past six years, and I highly recommend it. It’s very user friendly! Sign up for our newsletter to stay up to date on all our new posts, plus our shop announcements. As a subscriber benefit you'll get access to our resource library! A Cultivated Nest makes no claims of “expert status” and the owner will not be liable for any losses, injuries, or damages from the use of the information found on this website. Posts may contain affiliate links. A Cultivated Nest is a participant in the Amazon Services LLC Associates Program, an affiliate advertising program designed to provide a means for sites to earn advertising fees by advertising and linking to Amazon.com. A Cultivated Nest is also a participant in the Etsy affiliate program via Awin. This means that I may earn a small commission from some of the links in my posts. Please see our Disclosure Page for more information.